How concerned are economic leaders with political uncertainty? World leaders get it: The public doesn't trust them after decades of rising inequality and feeling left out by global trade. Many economists believe the political uncertainty of Brexit and Donald Trump pose major risks to the global economy. Those risks stem from public mistrust for government leaders and their inability to distribute wealth more evenly and help people who believe they have been hurt by trade. "I am seriously concerned on this," Germany's finance minister, Wolfgang Schauble, told CNN's Richard Quest at an International Monetary Fund meeting in Washington. "You can look all over at the advanced economies -- the British referendum, the campaign in the United States ... more and more people don't trust their elites. They don't trust their economic leaders, and they don't trust their political leaders." He's not alone. Bank of England Governor Mark Carney, three months after Britain voted to leave the European Union, believes more needs to be done to fix income inequality and who benefits from global trade. Saying that global economic growth is low is no longer an excuse, he argues. "Growth has been too low, but also sharing the fruits of growth has not been there," Carney told Quest. Carney said governments can rebuild trust by being candid with the public. IMF managing director Christine Lagarde acknowledged that countries need to address the "backlash that we are seeing in many corners of the world -- against trade, against innovation." 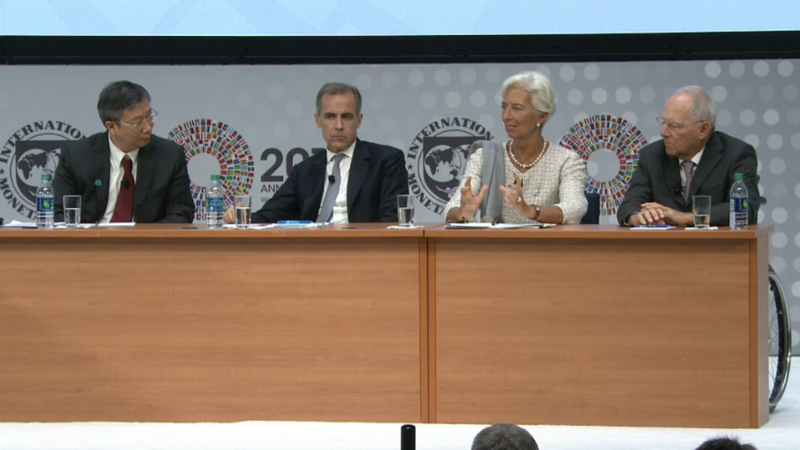 "Too slow for too long benefiting too few," Lagarde told Quest, referring to global growth. The sobering comments come about a month before the U.S. election, which has had an anti-trade flair all year. Donald Trump, the Republican nominee, has threatened to get rid of trade deals and slap tariffs on Mexico and China. His rise was just as unexpected as the British vote in June. One reason for Brexit was a belief that trade had hurt more people than it benefited. Although a trove of analysis points to the contrary -- that trade helps more people than it bruises -- Carney realizes the benefits of trade, such as lower consumer prices, need to be explained in more concrete ways. He asked rhetorically: "How do we make trade tangible?"